After performances in Fort Langley and at Township 7 vineyard, Bard in the Valley's summer production Julius Caesar, directed by Darcy J. Knopp, moves to the Spirit Square stage in Douglas Park on Thursday, July 24. Performances continue until Aug. 3. Friends, Romans, countrymen – and Langley theatre lovers – lend me your ears. 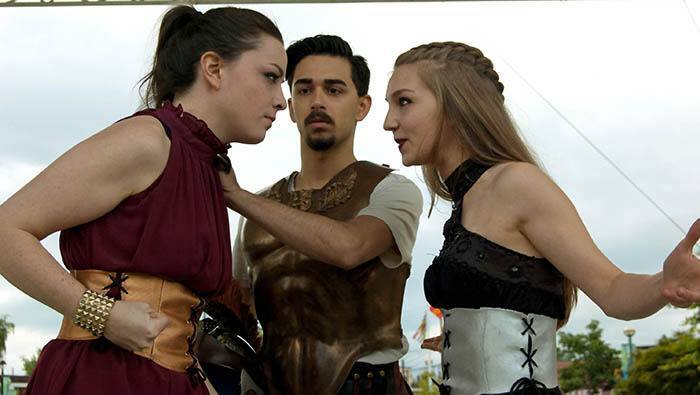 Bard in the Valley’s latest production, Shakespearean tragedy Julius Caesar, moves on to Spirit Square Stage in Douglas Park from July 24 to August 3 for the final leg of their summer season. Admission is free for the performances, scheduled to take place July 24, 25, 26, 27, 31 and August 1, 2 and 3. Evening performances begin at 7 p.m. and Sunday matinees will be held at 2 p.m. Previous performances took place in Fort Langley during Canada Day Celebrations and at the Township 7 Winery in Langley. The production, which celebrates the fifth anniversary of Bard in the Valley, takes a gritty look at honour, patriotism and friendship in the wake of an empire on the road to ruin. Attendees are invited to come early and bring a blanket, lawn chairs and a picnic. Theatre snacks will be sold onsite.